As some of the readers of Advanced Aquarist and before that Aquarium Frontiers may know I am the editor of both publications. 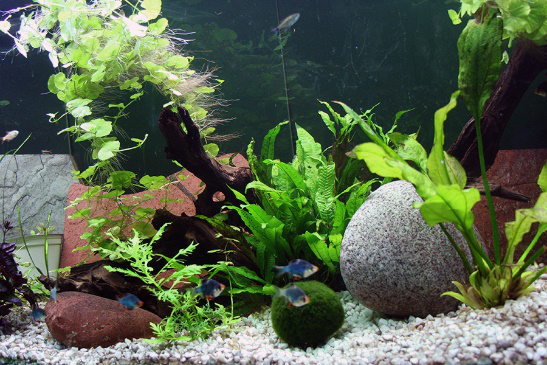 Several years ago due to the cost of electricity and a variety of other things I converted my 10-foot reef tank into a Dutch style freshwater planted tank. 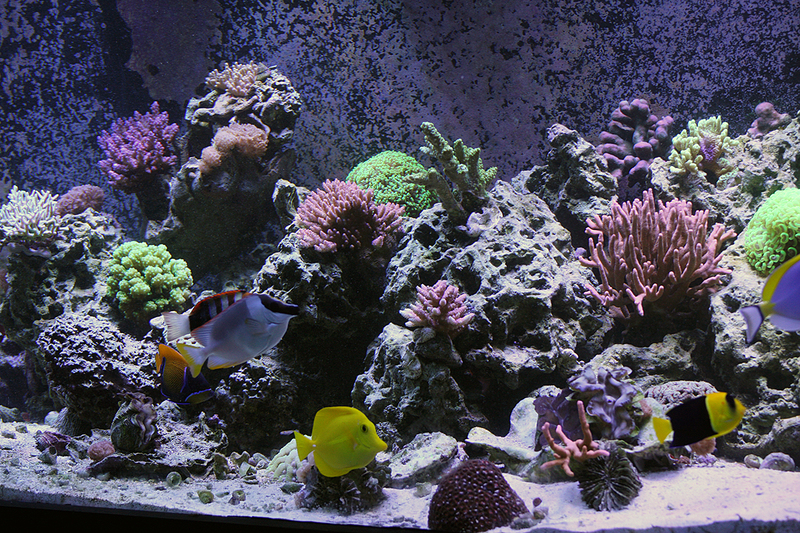 Also, because I did not want to be without a reef tank I set up a 90-gallon reef tank. 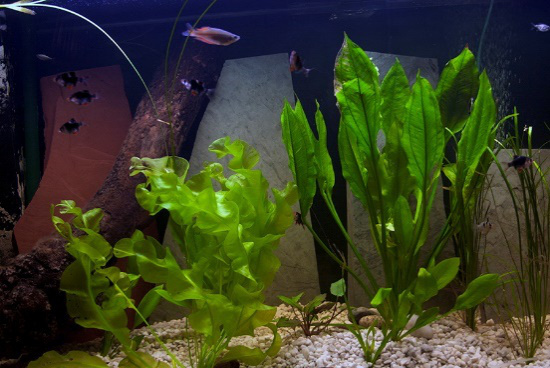 Following are some pictures of the 10-foot aquarium as a freshwater tank. 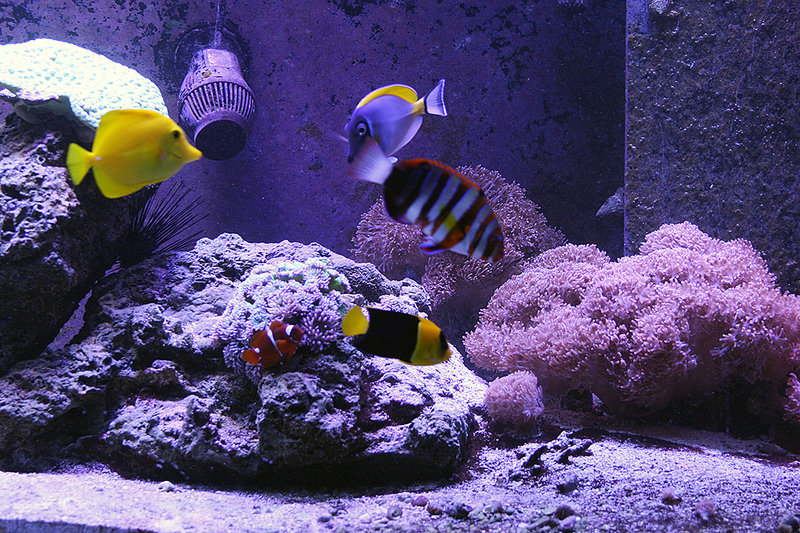 Making the conversion from a 90-gallon reef tank to my 10 foot 400+ gallon reef tank required a great deal of help. My friend Paul Chmielecki drove all the way from around Cleveland Ohio to the tip of Cape Cod to help me. 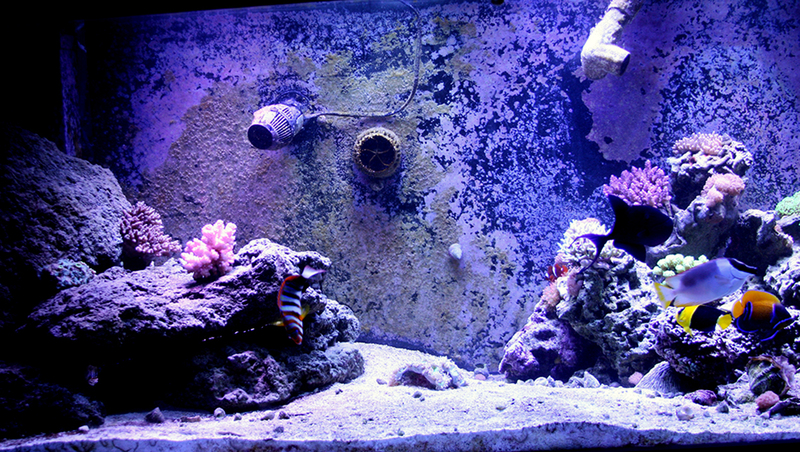 Also, he was able to swap plus some cash and my 90-gallon glass reef tank for a 110 gallon Plexiglas sump. Pictures in later editorials. 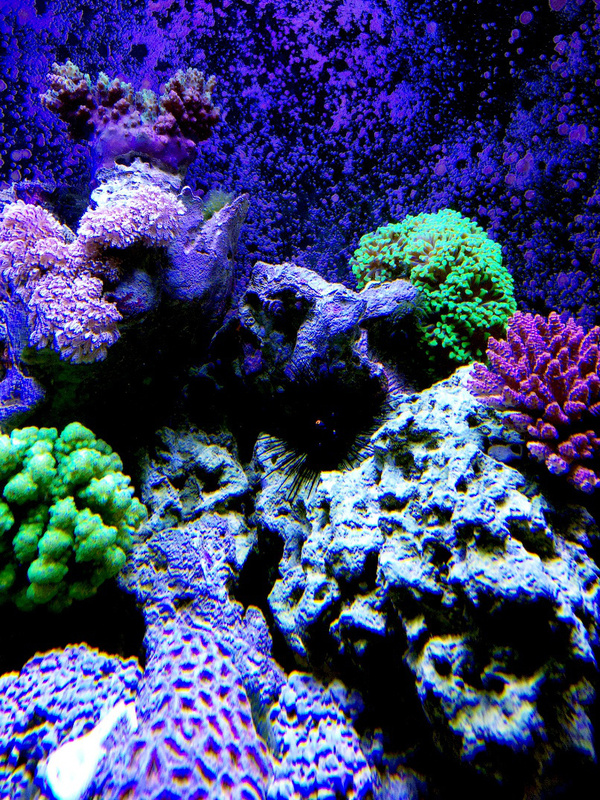 Reef keepers are special biophilic people. One problem that I encountered in my 90-gallon reef tank before the transition was a struggle with hair algae — the feathery type known as Bryopsis. In the 90 gallon tank I was able to essentially eliminate this nuisance alga after months of frustration pulling it out manually with the addition of a baby Diadema antillarum. This Diadema fed on the Bryopsis and successfully eliminated it where ever it could reach it. However, there were places where it could not reach it and when I transferred the coral and rock to the 10-foot tank it reappeared. 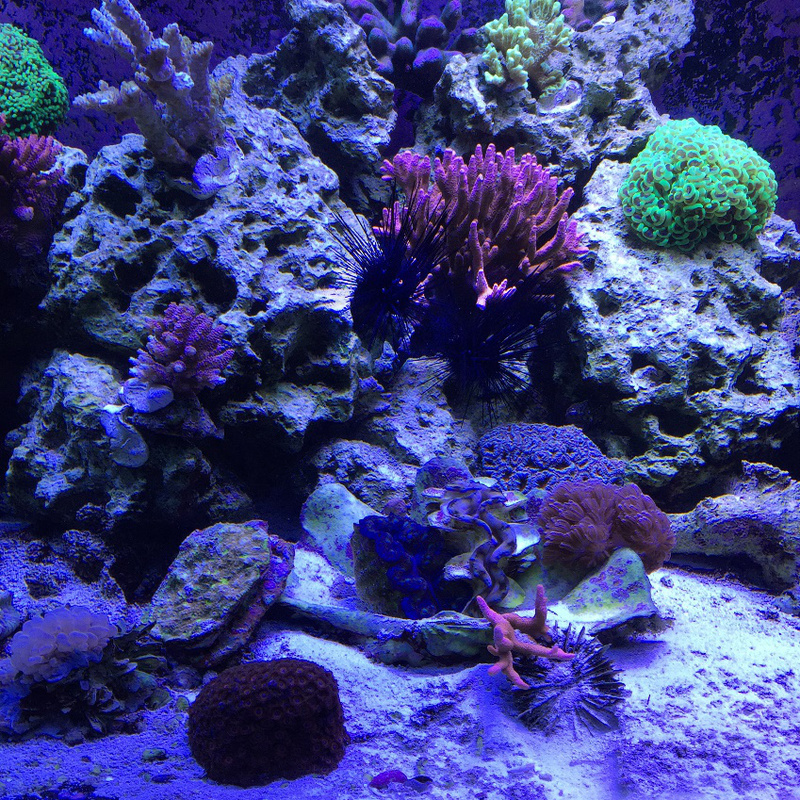 For some reason, unknown to me, the Diadema which had grown quite large in the 90-gallon tank did not survive the transition to the larger reef tank. Below the branching Montipora you can barely make out the two Diademas. 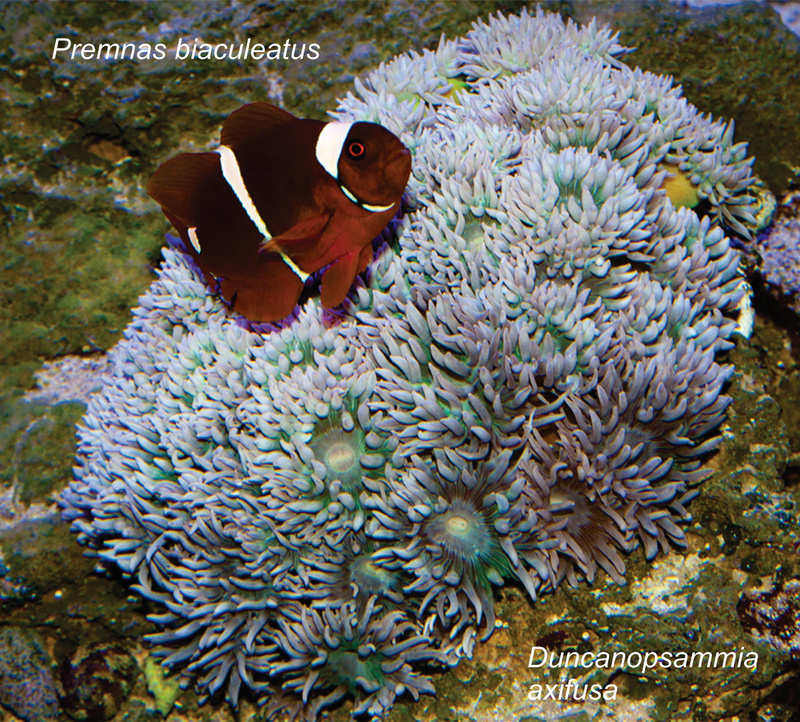 So, once again I was confronted with a nuisance alga that as most reefers know could become an overwhelming problem particularly in a large reef tank. Thinking that I could solve the problem the way I did before I purchased two small Diademas. Unfortunately, they had no interest in the hair algae. They are excellent herbivores and have grown quite large keeping the live rock quite clean of other forms of algae, but avoid the Bryopsis. I might add that other herbivores, like various snails and crabs also showed no interest in eating this invasive alga. As you can see my surgeon fish and my Fox face also have shown no interest in this nuisance algae. Using the web to check to see if other aquarists had any success eliminating this hair alga I tried various talked about methods, including adding about a gallon of Kent Tech magnesium, thereby raising the magnesium concentration to over 1600 ppm. Although other people have found this method effective at reducing or eliminating hair algae I was only partially successful with this addition of magnesium. It took about a gallon of Kent’s tech magnesium to raise the concentration of magnesium to the point where the Bryopsis stopped growing and began to lighten in color. Once the magnesium level began to drop the Bryopsis began to grow again. I began round 2 with my battle with Bryopsis by utilizing what I would call a multipronged attack. As you can see, from the photographs there is no longer any of this nuisance algae. The way I eliminated this nuisance alga was to reduce phosphates by setting up a DIY device whereby water, approximately 500 gallons per hour, would flow through a DIY device containing Two Little Fishes’ PhosBan and ESV’s activated carbon. I changed these chemicals weekly. By doing this I was able to keep the inorganic PO4 level below 0.02 ppm. Also, I began to dose approximately 10 mL of Vodka daily, which kept the NO3 concentration to an unreadable level. On top of this, I changed the way I feed Mysis shrimp. 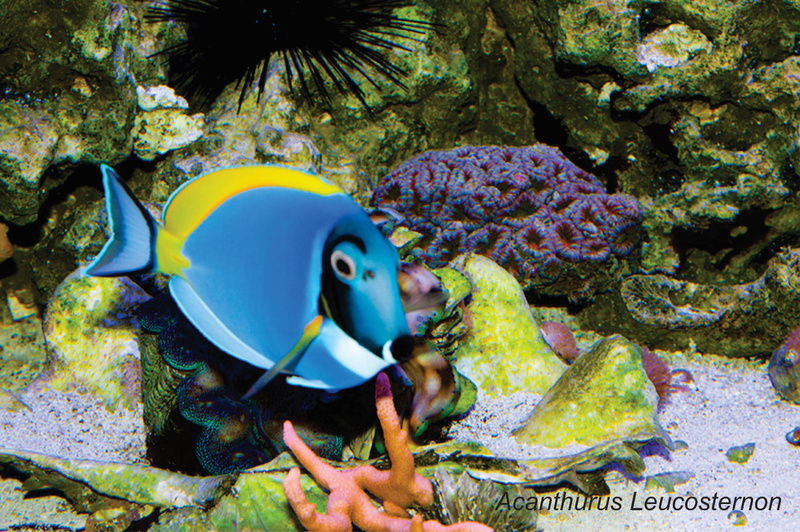 The water circulation from the sump to the reef tank utilizes three DC pumps flowing combined approximately 8000 gallons per hour. The three DC pumps each have a feed button, which shuts them down for exactly 10 minutes. What I would do, whether I was feeding Mysis shrimp or flake food was to shut the pumps off, wash the food thoroughly then add it to the tank with the pumps shut down. In this way, little if any uneaten food would find its way into the sump where it would decay into nutrients that I did not want. 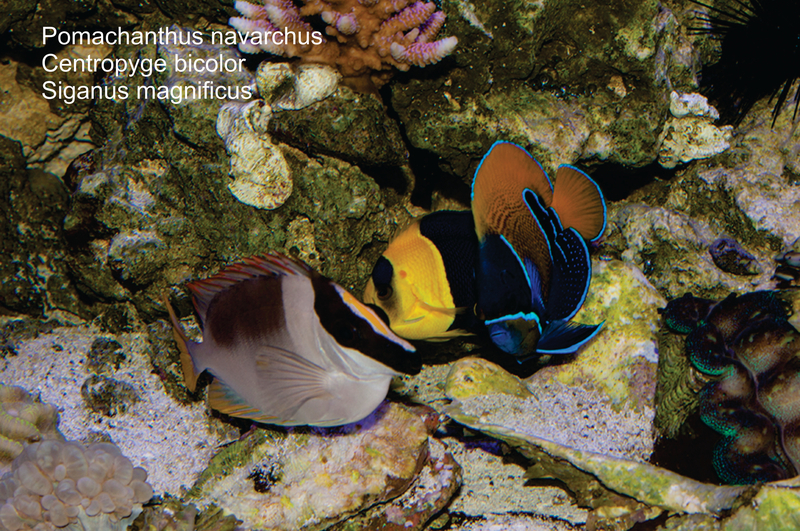 Uploaded by Advanced Aquarist on 2016-03-23. I’ll have more to report in the months to come.